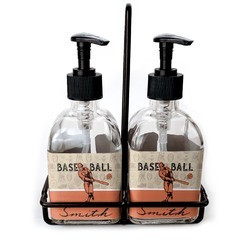 Turn this sink necessity into a design statement with this personalized Soap & Lotion Dispenser set! It is a great accessory accent for a kitchen or bathroom. These dispensers have a durable glass body with a black, plastic pump. They are each 6.5 inches tall with 2.25 square base, which lets them sit easily in the little black frame. On the dispensers, a personalized sticker label will cover three sides. This allows the amount of liquid inside to be viewed from the back. You can customize your dispensers by choosing the design, font, and colors. Put your name, initial, monogram, or other text of your choice to make them yours, or just label them "soap" and "lotion."